From early in the 15th century distilled rice sake was imported from Thailand to Okinawa in ceramic urns. 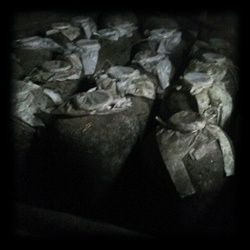 Shortly after the techniques of distilling were brought to Okinawa (there is no definite proof but these techniques are believed to come from Thailand or China Or both) and local production began in earnest. Origonally awamori was simply known as [saki]. The basically accepted origon of the name ‘awamori’ comes from the the way of determing the alchohol content of sake. When the sake was poured into a container the resulting build-up (mori) of froth(awa) was used to determine the alchohol content. This was later the name given to the sake. Even today awamori is made from imported Thai rice and Black spore is the fermenting agent. Awamori aged for more than 3 years is called ‘kuusu’. Freshly distlled awamori has both a slightly harsh taste and aroma, but the chemical composition gradually changes with ageing. After 3 or 4 years it has a much smoother taste and sweeter aroma which continues to increase the longer the awamori is aged. Ceramic pots have traditionally been used for ageing. There is a unique reaction between the awamori and the chemical composition of the ceramic container. The big four metallic ions that have the biggest influenceare Iron, Magnesium, Calcium and Manganese. Depending on the proportion of each of these ions in the clay the flavor of the same awamori can differ dramatically. As opposed to other containers a good ceramic urn speeds up the ageing process giving a deep,rich flavor and aroma. What determines a Good Ceramic Container? –A reasonable thickness (8mm~12mm) that has been thoroughly vitrified. Where as water may not permeate the walls of the pot,alchohol can so a well fired pot is essential. –A good balance of iron,magnesium,calcium and manganese and minerals in the clay. This balance can only be determined by lengthy testing. I dig many varieties of clay and in the pure state turn them into pots and age awamori in them for at least 3 years. Depending on the clay the flavor and aroma differs radically. Some clays promote flavor but not aroma and vice-versa. By combining these clays I get an allround ‘good’ container. Even though I have all my clays chemically analysed theonly true way to determine a good combination of clays is by constant testing. –The containers must not be glazed. A glazed pot is in effect the same as ageing awamori in a glass bottle. Although ageing in a glazed vessel does change the flavor it doesn’t produce the deep flavor and aroma that unglazed containers give. The chemical reaction is entirely different. Hydrolysis of the fatty acids in the sake occurs in unglazed pots but not in glass or stainless containers. For a more detailed explanation please contact me.